Ford Racing boss Jamie Allison has all but confirmed that there will be a Cobra Jet package for the next generation Ford Mustang – seemingly (and thankfully) putting to sleep any of the rumors that the next generation Cobra Jet would be based on some other model in the Ford lineup. This all began last month when Hot Rod received confirmation that Ford Racing was already working on the next generation Cobra Jet drag race package but when Ford wouldn’t confirm that the next Cobra Jet would be based on the Mustang, rumors were plentiful that the new Cobra Jet could be built on some vehicle other than the Mustang. Rumors from various media sources and enthusiast communities alike speculated that the 2015 Cobra Jet could be a race ready, rear wheel drive version of the Ford Taurus or the new Ford Fusion. Those suggestions were so absurd to me that I didn’t give it a second thought as, with the Cobra Jet competing in the Super Stock classes, Ford would have to begin offering either the Taurus or the Fusion as a rear wheel drive model. 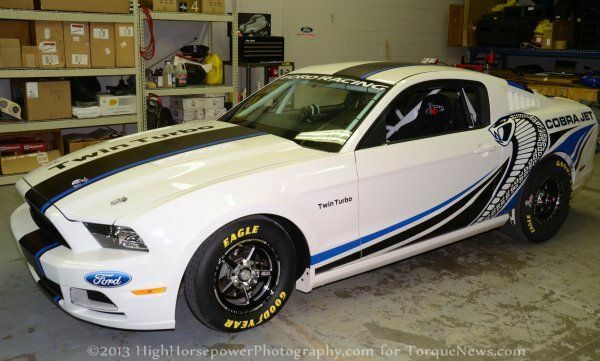 Once Ford Motor Company began selling rear wheel drive Taurus or Fusion sedans, Ford Racing could – in theory – then begin offering up a Cobra Jet version of one of those two cars. You know…because there are so many Super Stock sedans tearing up the NHRA. Anyways, the folks from Mustangs Daily had a chance to speak with Ford Racing boss Jamie Allison and while he didn’t offer any real details on the future of the Cobra Jet race package, he proclaimed that “Mustang and Cobra Jet are inseparable.” That seemingly confirms that there will be a Cobra Jet 2015 Ford Mustang but those hoping to see an 8 second, NHRA approved Taurus or Fusion should take note of the fact that he didn’t say that there would only be a Cobra Jet Mustang…so there is still technically a chance that some other model could get the Cobra Jet treatment for 2015. Ford Racing introduced an awesome twin turbo EcoBoost Cobra Jet Mustang Concept at the 2012 SEMA Show (shown above) and it has been speculated that the EcoBoost’d 5.0L V8 could be the next generation Cobra Jet engine. Ford has displayed SO much success over the past few years with the EcoBoost option in the F150, Explorer, Taurus, Fusion, Escape, Focus and Fiesta that it would seem to make perfect sense that Ford Racing would adapt the EcoBoost technology to power the world’s fastest Mustang. The twin turbo Cobra Jet concept from SEMA could offer improved performance compared to the supercharged Cobra Jet thanks to the fact that turbocharging is more efficient than supercharging so by offering engine technology that is already in use in street trim in other vehicles, Ford Racing could soup up the Cobra Jet lineup without any significant levels of R&D work on their part…not counting the effort that went into the Cobra Jet EcoBoost Concept and the rest of the EcoBoost cars, trucks and SUVs sold around the world.